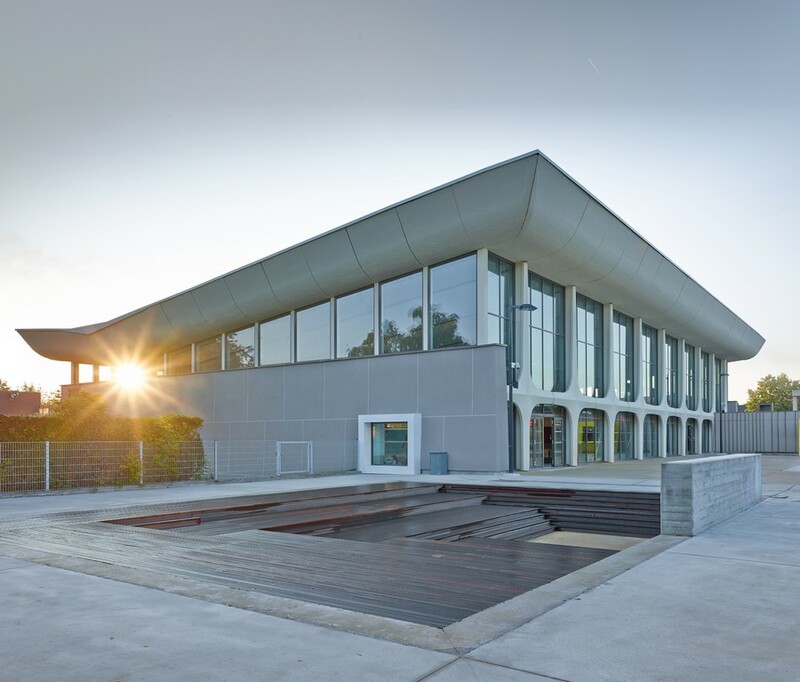 In these times of sustainable development and fostering heritage, the city of Montigny-lès-Metz, decided to rehabilitate and extend the Montigny-les-Metz Aquatic Centre, located at 19 rue Pierre de Coubertin. It was a complex combining around of a common lobby, pool and public areas, an area associative offices, apartment keeper and upstairs restaurant school. This building was installed bracket along the public domain in the North East and South Is bordering the square Pierre de Coubertin and opened to South West on a large tile occupied by a sports pool 50×20 meters, a diving pool of 12,5×12,5 meters and a pond playful 10×12,5 meter itself light overlooking a large space leafy green. 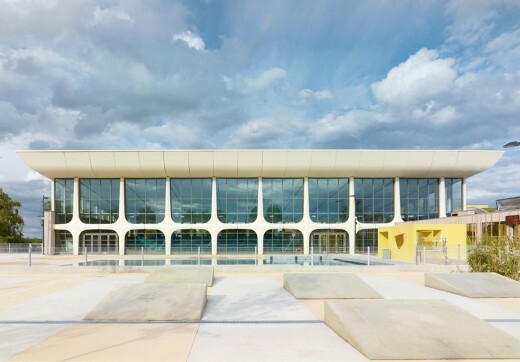 The pool of Montigny-lès-Metz was designed by the architect Jean Bigard in 1969. In 2011, it was no longer possible to satisfy the requirements that demand a nautical center at the technique level, and in terms of hygiene and Accessibility. 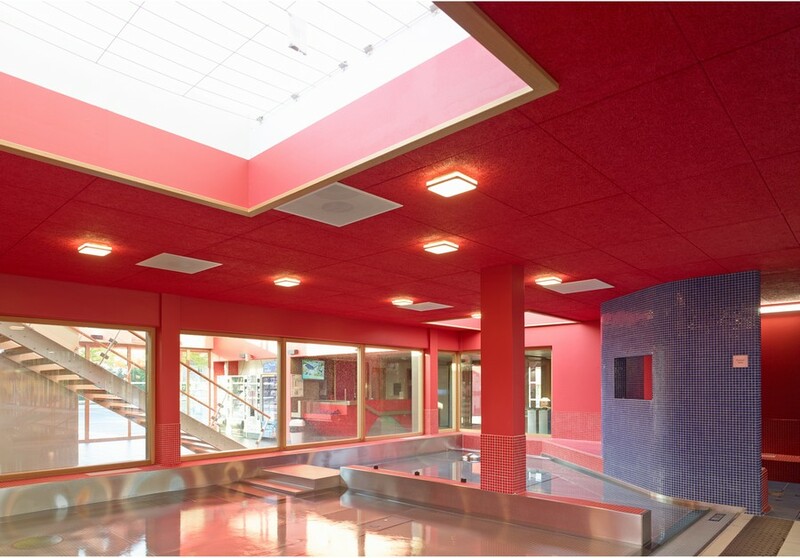 Our project involved the partial demolition of the existing, that is to say, all the places dedicated to the public reception (reception, changing rooms, staff rooms and outdoor pools) in order to keep the hall basins in addition of being an element that represents the memory as an element for a strong architectural identity. 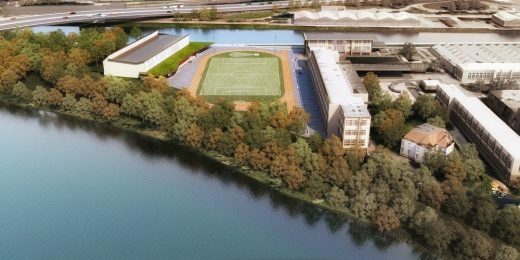 Our project is a continuation of what was created by Jean Bigard, a hall of monumental basins treated in length and close from the plot. The majority of new buildings shows the location of the existing buildings demolished. Only the lobby and local personnel are added to the front parking lot side. These premises are the same size as those demolished, playing politeness and discretion, saying the emergence of the retained hall. Only a few roofs movements are marked by oblique vegetated, elements that signal and call. The sheltered courtyard, is itself centered on the complex, and gives to it a strong signal to identify at a glance the main entrance: a portico sheltered from the forecourt to the entrance of the school allows both to provide a sheltered waiting area, but also to create buffer with locker rooms, a patio here used to filter views from the parking lot. The project offers an outdoor 10×20 meters’ pool in stainless steel taking place in a part of the grip of the former 50-meter pool. The latter of which, still the imprint device with a set of benches treated rough concrete, harmonizes with the colors of the outer beaches concrete acid. Disbursed in the slab are treated planted planters of different grass species and medium stemmed trees. On the diving pool recapped, took a set of umbrellas at different heights in thermally treated wood, treated pergola around a core structure and wood siding, natural tone in which are arranged the bar and its reserve. Gaming stretched canvas, in some of these pergolas, allow to take shelter from the rain. 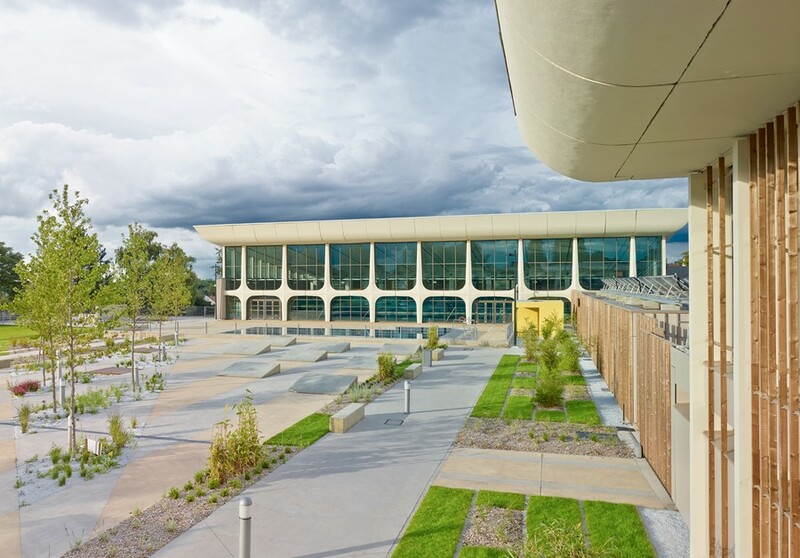 The training pool is transformed into open-air theater by recharge concrete and wood cladding. 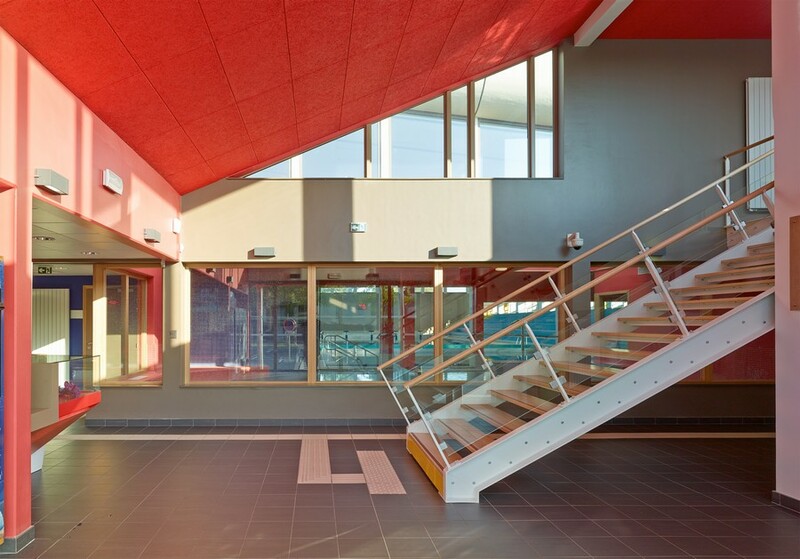 It is used for animations in attendance, for outdoor centers or solarium terraces by the public.